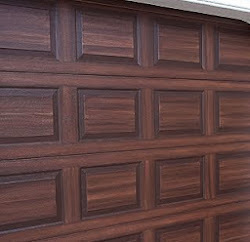 Really getting off to a great start this week on the painting a garage door to look like wood project. 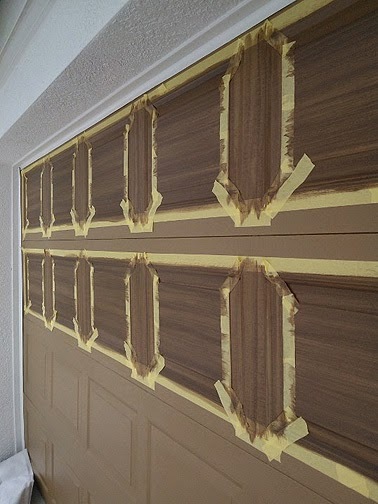 After cleaning, priming and applying the base coat of paint on Friday I started the wood graining process Monday. 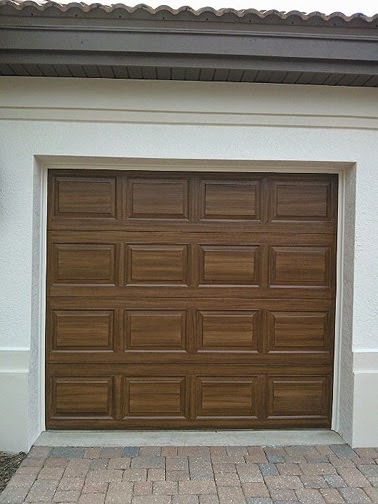 With these doors I am going for a Walnut wood look. So the base coat of paint is SW Toasty, then I use Java for the first coat of wood grain color and Turkish Coffee for the second and darker wood grain color. 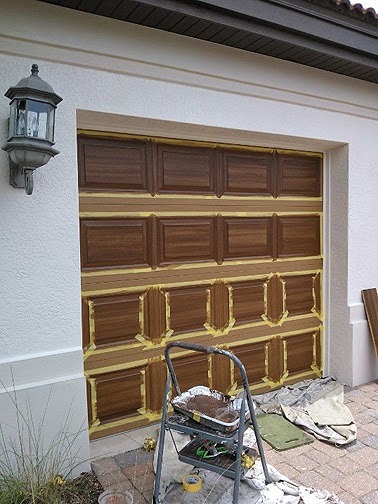 In the first photo it shows the single garage door with the top two rows of panels painted to look like wood and I am working on the bottom two panels. At the point in the photo I have finished with the center of the panels and I am working on the vertical spaces between the horizontal center part. 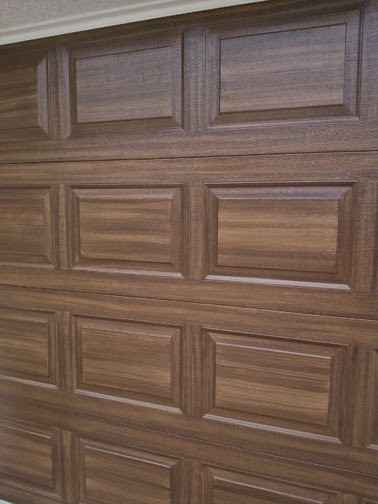 The next photo shows the door with all the rows of panels complete. 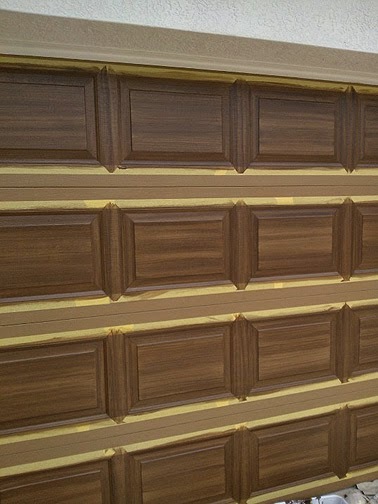 You can see how I have painted the wood grain in a vertical direction in the space between the center of the panels. At this point I reposition the tape and paint in the horizontal areas between the rows of panels. 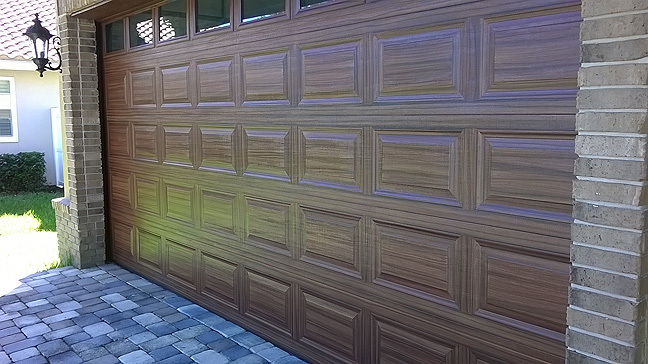 The next two photographs show the completed garage door painted to look like wood. After I finished the single door I started on the double door. I was able to get the top two rows complete on that door today (Tuesday). 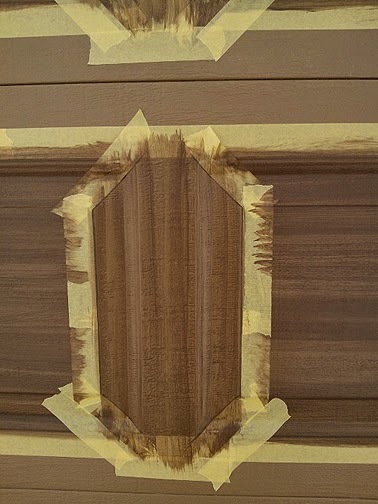 This next picture is a good one to show how I have repositioned the tape to allow me to paint the wood grain in the vertical area between the panels. When I took this I had only painted the first wood grain color in.